On this date in 1943, a special transport of 1,196 children and 53 adults arrived at Auschwitz and were gassed shortly thereafter. Thus ended one of the lesser-known tragedies of the Holocaust. At the time, there were tentative negotiations between the Red Cross and the Nazis to trade Jewish children for either German prisoners of war or cold, hard cash. The exact details are unclear, and there’s a great deal of contradictory information about the entire event. 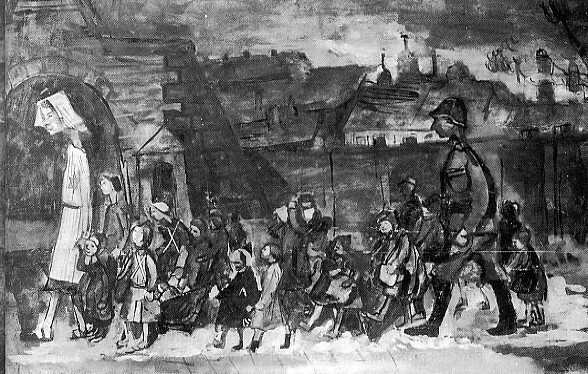 In any case, the Germans selected children from Bialystok, one of the few places in Nazi Europe where there were any Jewish children left alive. The children, looking like scarecrows, refused to undress. They held on to their dirty clothing, the older stepping in front of the young ones, protecting them with their bodies, clutching their hands and comforting those that were crying. Their clothing permeated with lice, their bodies full of sores, these children refused to wash.
Their first stop was Theresienstadt in Czechoslovakia, the so-called “model ghetto” which was used by the Nazis as a propaganda tool to show that they weren’t mistreating their Jews. Theresienstadt was in fact a horribly overcrowded, disease-ridden city and its inhabitants were all dying of starvation, but it was the best there was available. There were no gas chambers there, and the Theresienstadters knew nothing about the kinds of horrors the Bialystok children had been through. To keep knowledge of said horrors from leaking out, once in Theresienstadt the children were placed in isolation and weren’t allowed to leave their barracks. 53 doctors and nurses were recruited from the local population to take care of them, and they were locked up with the children. In spite of these security measures, some of the adults were able to make contact with people from the outside. Theresienstadt youth leader Fredy Hirsch got caught making an unauthorized visit to the children’s barracks, for example, and as punishment he was sent to Auschwitz on the next train. 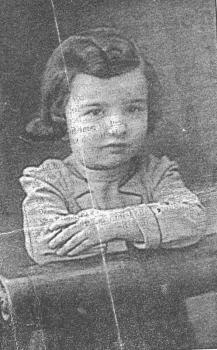 A child thought to be Deborah Klementynowska, possibly the only surviving photo of one of these lost Bialystok children. The adults — one of whom was Franz Kafka‘s sister, Ottilie — didn’t know what to make of the children’s behavior at first. For instance, why, when they were invited to take a shower, did they start crying and screaming about gas? The children started to talk about their experiences, and their caregivers were horrified by their stories. The Nazis intended to quite literally fatten up the children before they were sent off into the world, so the group was treated very well. Everyone got enough to eat, and they were given baths, clean clothes, medical treatment and even toys. Anyone who got seriously ill was taken away “to the hospital” and, ahem, never returned. Slowly, assisted by their kind caregivers, the children got their equilibrium and began to act like normal kids again. The Germans wanted the children sent to Great Britain instead. The UK, however, had already accepted many Jewish refugees, including 10,000 German, Austrian and Czech children with the Kindertransport, and were unwilling to take in any more. And there was another problem, relating to the prospect of exchanging the children for money. This money would have to be provided by the American Joint Distribution Committee and other Jewish welfare agencies, and they flat-out refused to give anything to the people who had promised to wipe them off the face of the earth. In the end, the negotiations collapsed, through what one witness later called “an ill-applied sense of ‘correctness'” on the part of the Allies. Of course, given the Nazis’ track record, one wonders if they ever seriously intended to release the children no matter what they were given in return. The plan was discarded and the Germans were left with 1,196 useless Jewish children on their hands. They dealt with them in the usual manner. None of the Bialystok group or their caregivers had any idea what was coming up for them when they were sent away from Theresienstadt. They’d been told the negotiations had been successful and they were on their way to Switzerland, and thence to Palestine. They were told to take off their yellow stars and the adults had to sign a statement promising not to say anything bad about the Germans. The transport set off in high spirits, rejoicing at their upcoming freedom. But their train went not to Switzerland but to Poland, marked for “special treatment” on arrival at its destination. Apart from a few of the adults who were selected to work, there were no survivors. May we never forget these little ones.